Now that the rhubarb patch in my parents' backyard has fully blossomed, I've been taking full advantage of it by trying out lots of rhubarb recipes when I visit! Even though rhubarb is technically a vegetable, I've most often had it in sweet treats like muffins, pies, and crisps. Strawberry-rhubarb pie is one of my all-time favourite desserts, but I've been wanting to try using rhubarb in more savory recipes. Last year, I tried this savory rhubarb and kale pasta (seen in this recipe round-up from last year), and I've also had my eye on a recipe for Indian spiced lentils with spinach and rhubarb from Vegetarian Times. 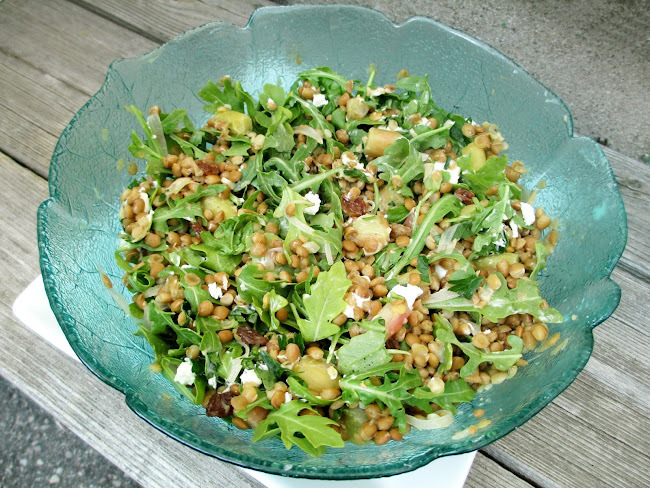 I liked the idea of combining lentils with rhubarb to add a sour component, but with the hot weather we've had here the last couple of days, I couldn't imagine eating a bowl of curry with rice for dinner so I improvised by creating this more seasonal salad combining rhubarb with lentils, arugula and goat cheese. I served this to my family for dinner with the warning that it was an "experimental salad", but we all ended up really enjoying it! The rhubarb was just soft enough to blend into the lentils without being too mushy, and I thought they added just enough tart flavour without overpowering the dish. The salad as a whole was definitely still on the tangy side from the rhubarb and the vinegar in the dressing, but the sourness was balanced out by the addition of sweet raisins and creamy goat cheese. So if you have some rhubarb to use up and you're looking for something different to do with it other than making a dessert, I recommend trying it in a savory salad like this one! And for more rhubarb ideas, check back later this week for a round-up of some of the other rhubarb recipes I've made recently! Heat olive oil in a large skillet over medium heat. Add garlic and sauté for about 30 seconds, stirring. Add shallot and ginger and cook, stirring often, until shallots start to brown (about 3-4 minutes). Add rhubarb and cook until rhubarb softens, about 2-3 minutes (you don't want it to break down fully). Stir in lentils and let cook until lentils are heated through. Transfer mixture to a bowl. 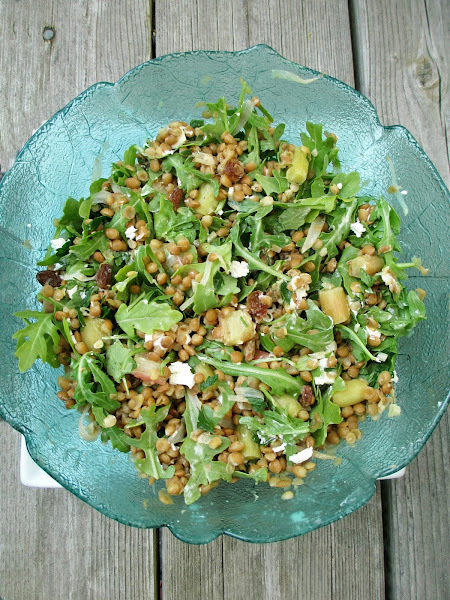 Add raisins, parsley, arugula and goat cheese to the bowl and toss to combine. (Note: you can make everything up to this point and let sit at room temperature until ready to serve. I took my photos at this point before adding the dressing). To make dressing, whisk together all ingredients in a small bowl. 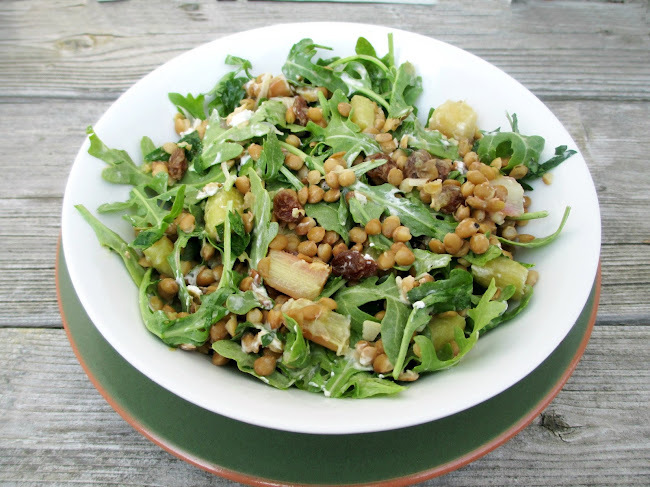 When ready to serve, pour dressing over salad and toss to combine (you may not need all of the dressing). Makes about 4 servings as a side dish. i've never had rhubarb before, probably because i thought it was only found in strawberry rhubarb pie, which i've never had. i love the option to add it to savory meals. i really need to give it a try now! 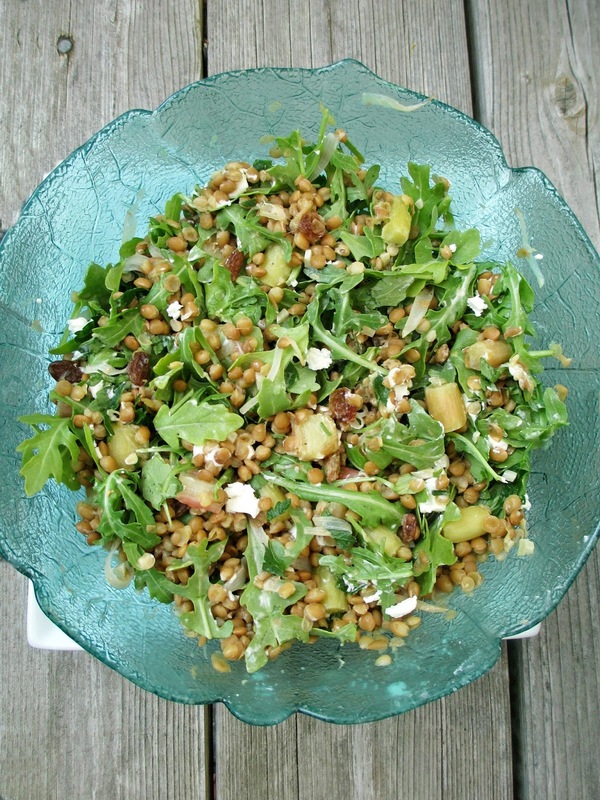 This looks so fresh and light but I like that it adds lentils to be more filling! I only tried your leftovers without much arugula in it but I loved this! I don't think I've seen rhubarb in a savory dish before. But I love lentils, so I'm betting I'd love this too! Yum! Love rhubarb! :) I usually use it in desserts and muffins too, but think it would be fantastic in a salad! Lentils, arugula and goat cheese are some of my favourite things! I bet the rhubarb is excellent in this.